During the Elk Grove City Council's most recent meeting on Wednesday, September 26, a city resident presented council members with a chunk of broken asphalt found on the city's streets. Noting the potholes were spotted while on her way to pick up a pizza, Elk Grove resident Lynn Wheat told the council members that she submitted an application on behalf of the city with Dominos Pizza's Paving for Pizza program that offers complimentary repairs for potholes. 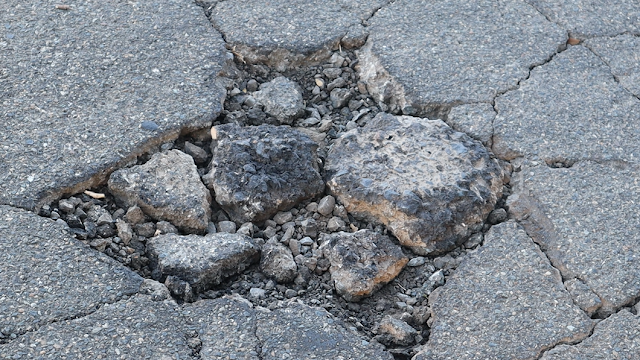 After receiving the asphalt and being informed of the application for repair with Dominos, the location of the pothole was turned over to the city's public works department for repair. As promised, potholes, located on Lujan Drive near Crucero Drive in Old Elk Grove, were repaired by Friday, September 28. Although the Dominos application and the subsequent repair by the city's public works department might seem trivial, there are some lessons to be learned for residents and policies to be explained by elected officials. The most obvious lesson, especially in any number of neighborhoods throughout the city that are experiencing failed asphalt, is residents need to inform them of situations such as this. Of course, the asphalt on Lujan Drive has been in the state of failure for several years as evidenced by this 2016 video, so it was not until Wheat asphalt shamed them that minor repairs were made. Another lesson is for residents to look at is where our city council seems to be focusing its efforts. For all the talk about strong neighborhoods, when it comes to roads, the city is more interested in expanding roads for new housing development ala the Kammerer Road extension than providing existing residents with adequately maintained streets and roads, especially in our older neighborhoods where roads have been in a state of failure for years. For those who subscribe to the broken window theory of neighborhood safety and improvement, this is a local case study in the making. With the city letting this or any neighborhood's streets go unmaintained and unrepaired while expending money for roads that will not benefit existing residents, it will over time result in undesirable consequences including increased crime. Is it the policy of the Elk Grove City Council to continually neglect older neighborhoods while pursuing a growth-at-any-cost strategy? Is this how stronger neighborhoods are built? If our mayor, and four city council members who pridefully proclaim they are elected on a citywide basis, are sincere in their words that they care about the whole city, not just the district they reside in, it is time to prove this otherwise these are just more empty words coming out of city hall. Is filling a pothole with asphalt a fix a flat?